Festa Brew has a new stout recipe that I haven’t tried so I thought I would pick some up and see how it is. I’m not really a stout drinker and not a big fan of Guinness, but I like to try different beers to appreciate the taste. In my haste to get the beer ready to drink this weekend I over carbonated it leaving me with an entire glass of head. An interesting note was that the head was cascading similar to draft Guinness. Regardless, I left the lid off the keg for a day to let the CO2 escape making the beer closer to drinkable so I had a couple of pints on Saturday during the Leaf game. The old stout recipe that Festa Brew used had hints of chocolate in the after taste which was very enjoyable, but it didn’t go down easy. I found after one pint that was all I wanted of it. The new recipe called Double Oatmeal Stout is much easier to drink. The beer is very dark, light does not pass through it, and the head is a nice toasty brown. The head is made of tiny bubbles and laces the glass as you drink it down. The smell is that of a typical stout with roasted malt and coffee scents. It isn’t apparent on the first pint, but after a couple the beer becomes sweet. It’s a nice contrast to the dark roasted flavour. For someone who enjoys stouts this is a great ready-brew recipe. 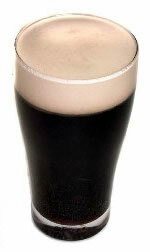 For those that don’t enjoy stouts this might just get you started on asking for a pint of the “Black Stuff”.